Firstly, many thanks to Mary who was a wonderful host. She is very thoughtful and caring about her guests. The apartment had everything that I needed to make my stay very comfortable and relaxing. Despite it being winter, I spent much time on the balcony basking in the afternoon sun and listening to the crashing waves onto the beach. Sunsets are also a pleasure to watch from the balcony. Despite being right on the promenade, there was no disturbing noise at all. The sound of the ocean was the most prominent and soothing sound. I ate out only twice during my week's stay as the apartment had all the necessary cookware and utensils to make cooking easy while being away from home. 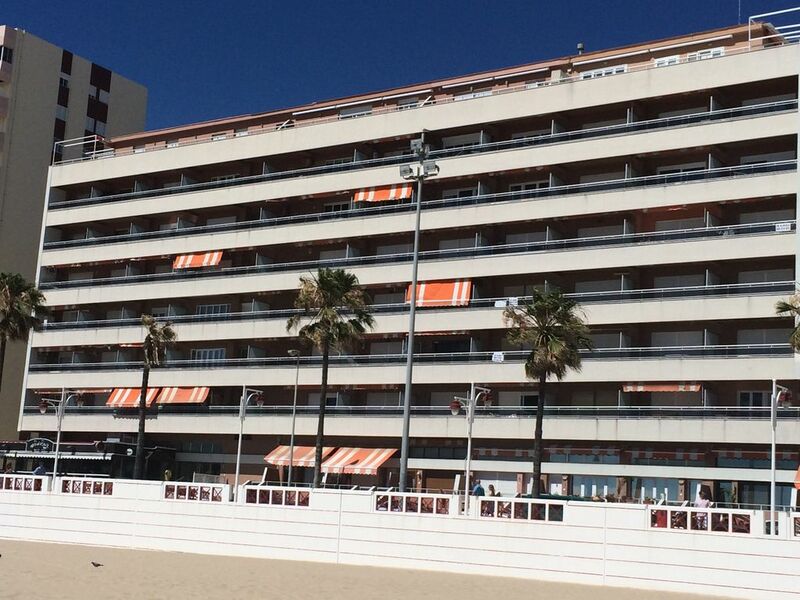 This seafront apartment is arranged on 3 floors and has 2 balconies overlooking the sea. The road running in front of the apartment is actually very quiet. There is a reasonable size supermarket within a 5 minute walk (by the football stadium) and on the way there is a tobacconist where you can buy a bus ticket card (just 70c to get into Cadiz) and top-ups. Note, the supermarket is closed on a Sunday although bakeries are open in the morning. There are loads of really good restaurants within walking distance so it’s not necessary to go into old Cadiz to eat (which is at least a 30 minute walk or 10 minute bus ride). This is very much a Spanish resort and the only time we heard English was when a cruise ship dropped its passengers off in old Cadiz. You will definitely need a phrase book or Google translate if you don’t speak Spanish! The apartment itself is well equipped including beach chairs, parasol and body boards (2 now as we bought one and left it there!) There are also plenty of towels including beach towels. The beach is great and kept clean. Mary is a fantastic hostess and had filled the fridge with cold beers, wine and cokes for our arrival which was much appreciated after the journey there. She also went above and beyond by going to the airport and picking up one of our suitcases that had got delayed in transit. The reason for not giving 5 stars is the decor in the apartment is somewhat tired in places and there were a few minor maintenance issues that Mary now knows about. However, these things did not affect our enjoyment of our holiday in Cadiz and would happily return. Oh - and watching the sunsets from the balcony cannot be beaten! Just returned from 7 nights in Mary's triplex. Perfect location for beach, restaurants, exploring the amazing city of Cadiz and having a relaxing time out. The beachfront location could not be bettered, the views, the wide expanse of Playa Victoria, the incredible sunsets all served to make this the perfect place. Playa Victoria as one of Europe's best blue flag beaches is evident by the amount of attention paid to it's maintenance, cleanliness and its pristine waters, perfect to experience chilling out, surfing, kite surfing and beach walking, the latter of which there are many without being crowded because of its expanse.There are a number of Chiringuito's all along the vast expanse of beach to enjoy shade from the midday sun, although dips in the sea, even in October, were a pleasure. The sights of Cadiz on the open top tourist bus is a must, there are cheap taxi's to take you to any part of this amazing peninsula surrounded by water. There are many little side streets in the old town with excellent restaurants together with cathedrals, churches and shops to investigate. Mary is a very helpful host, her triplex not only has the best views but also is well equipped, beautifully clean and comfortable and I have no doubt that we will be back again to hopefully relive the experience. Thank you very much for your review and your kind words!! It was a pleasure To meet you and That you enjoyed the stay and everything was perfect!! I am very happy To hear that! I hope To see you again very soon !! Greetings from our Triplex in Cadiz, your home!! Great location. Enjoyed watching the sunset over the sea. Good bus route into old Cadiz where there is lots to see. Plenty of restaurants within walking distance. Host Mary was very helpful. I would not hesitate to return in the future. We had an amazing vacation in this wonderful apartment, fantastically equipped with spectacular ocean views. We enjoyed the views of the beach, ocean, seafront and downtown. So relaxing stay hearing the ocean waves with a sunny beautiful weather. The location is great plenty of restaurants, bars and chiringuitos. Our kids had an amazing time. Lots of parks close to the apartment with slides and swings. Very easy and convenient close to transportation( bus and train) to visit the downtown or any other towns of the area. Mary Paz was very polite and welcoming taking care of every single detail making our stay just amazing. We definitely will love be back. Apartamento triplex con vistas espectaculares de la playa, océano, parte antigua de la ciudad y paseo marítimo. Súper relajante escuchar el romper de las olas en cualquier habitación del triplex con un clima soleado y precioso. Cercano y de fácil acceso a la playa, restaurantes, bares, chiringuitos, así como a los medios de transporte que ofrece la ciudad como el tren y bus, también con fácil salida para visitar otros pueblos de la zona así como al puerto marítimo. Nuestros niños los pasaron genial. Cercano a parques con columpios y juegos. Mary Paz cuido cada detalle magníficamente haciendo la estancia inolvidable. Estaremos más que encantados de volver!!! Ha sido un verdadero placer conoceros y a los pequeños! Saludos desde la terraza del atlántico !! So many positives about this apartment from the location, views, parking and facilities. Few negatives were mainly to do with maintenance of property which Mary is aware of and says she will rectify. Mary was very helpful and easy to contact and worked hard to resolve problems, she even purchased an electric kettle and teapot as we dont drink coffee. Some tips for your stay. Buy a bonobus card which (after a big search) is easiest purchased from the tobacconist opposite the harbour in town, located just beside the bus stops adjacent to a cafe/bar. You pay €1.5 to buy the card and load with minimum €7, this brings the cost of your tickets down from €1.10 to 70c and you just scan entering bus. The number 1 line runs every 5/10mins from outside the apartment into town and is a great way to travel, you can also connect with another line within 45 mins for free. We had a rental car which we only used when travelling outside Cadiz.The ticket shows remaining money and you can reload the ticket at the tobacconist when you run out. There is three flights of stairs in the apartment but they are not too many steps. Great place to stay in Cadiz. Thank you Mary. It is surrounded by the most popular restaurants, pubs, bars, beach facilities, showers, umbrellas and hammocks.